Peculiar species distinguished for its small sized yellowish blooms, very short flattened foliaceous central spines and few radial spines. Habitat: This species grows and hides in high grass, and the spines that looks like dried grass leaves, make the plants almost invisible in their natural environment. Etymology: The specific epithet "phyllacanthus" (leaf-spine) derives from the greek words “phyllon” (φυλλον) = leaf and “acantha” (ακανθα) = spine. 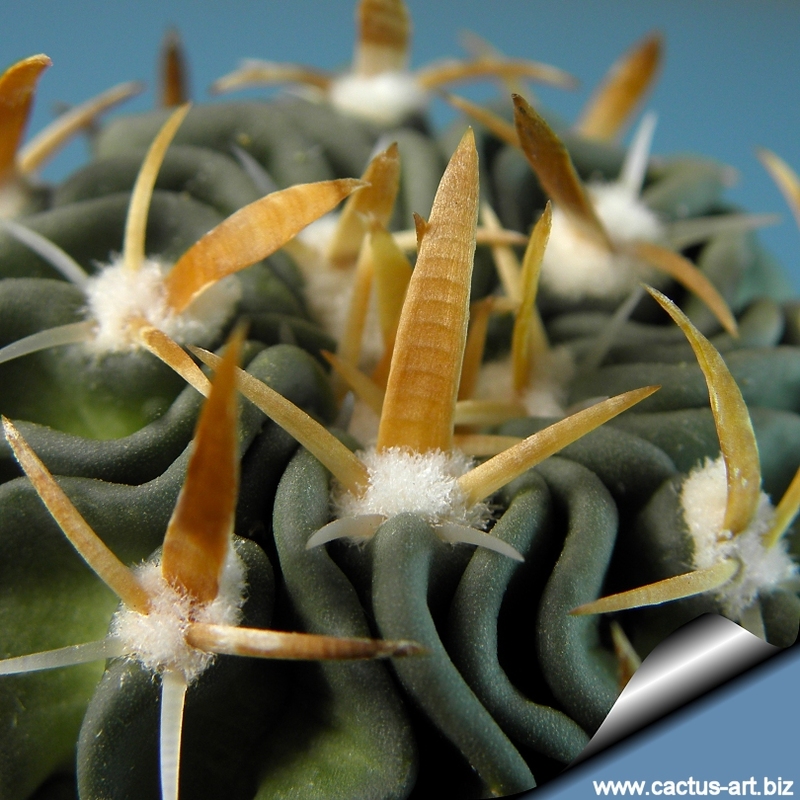 Stenocactus (E.) tricuspidatus (a multiheaded species) has been moved into S. phyllacanthus in the most recent revisions. 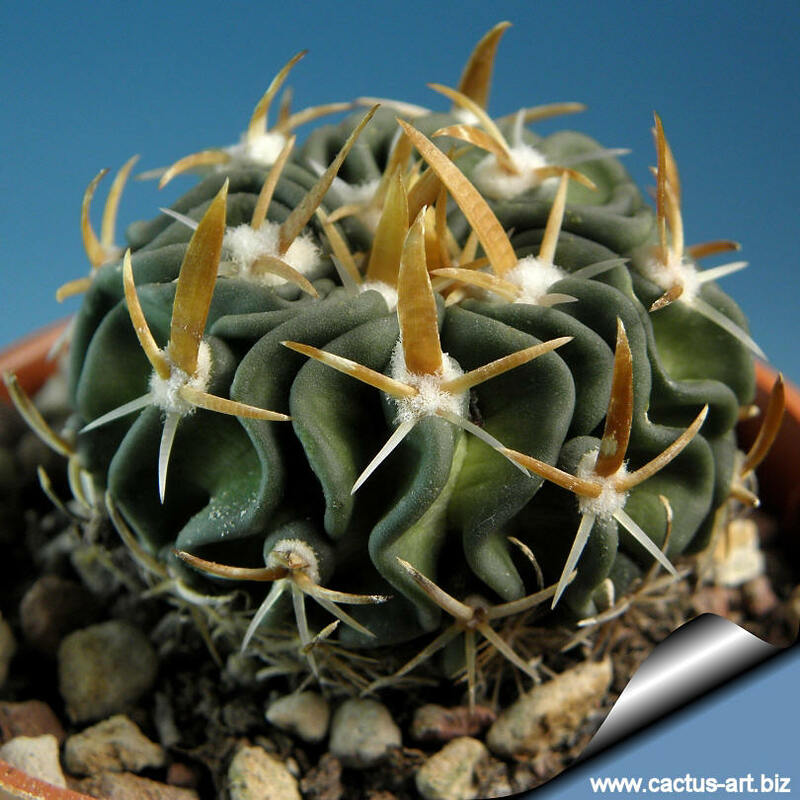 Description: Generally solitary than can occasionally produce small clumps. 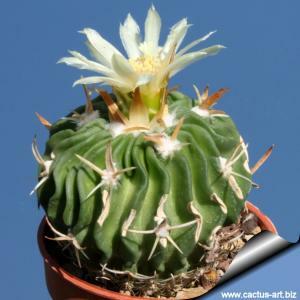 It is distinguished for the small sized yellowish blooms, very short flattened foliaceous central spines and few radial spines. Stem: Round to shortly cylindrical, apex flat or slightly depressed, up to 10 cm in diameter (but usually smaller) the epidermis is dark bluish-green. Older plants sometimes get corky near the base. Ribs: Numerous,25-40(-55) wavy, thin . Areoles: Well spaded (only 1 or 2 per ribs) Initially woolly, afterwards naked. Central spines: 3 short in the upper part of the areoles, lanceolate, straight or recurved 1-3 cm long, somewhat anulate, reddish to amber coloured (sometime with a darker tip) that becomes whitish as they ages. The upper one is very flat and sometime three-toothed at apex. Radial spines: 2 (occasionally more), appressed, in the bottom of the areole, awl shaped pointing downward, much shorter than the upper ones, up to 1 cm long. 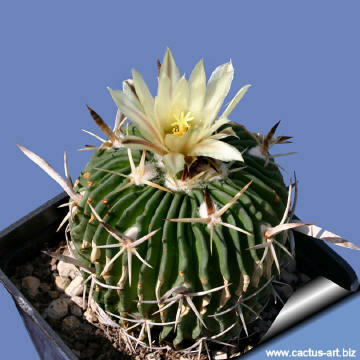 Flowers: Abundant up to 1,5 cm long, cream or yellowish-white often with darker reddish or brownish throat. Scales on the ovary ovate. Culture: Easy to to care and flower. No absolute schedule can be given for watering as various factors (Soil mixture, containers, drainage, temperature, size of plant) influence water use, so - as a general rule - the soil should be thoroughly wetted at each watering during the active growing season (spring and summer), water when the top 1,5- 2 cm of soil feels dry to the finger. Do not soak the soil during the dormant period. Be careful, excessive watering can make root and/or stem to rots. Make sure there is good air circulation between plants. Good drainage is essential along good moisture retention properties and adequate nutrients availability. Require bright sunlight to grow well. Dormant plants do best at temperatures from 5-10°C (but will tolerate -5° for short periods). The cooler temperatures develop sturdier plants and encourage the formation of flower buds.